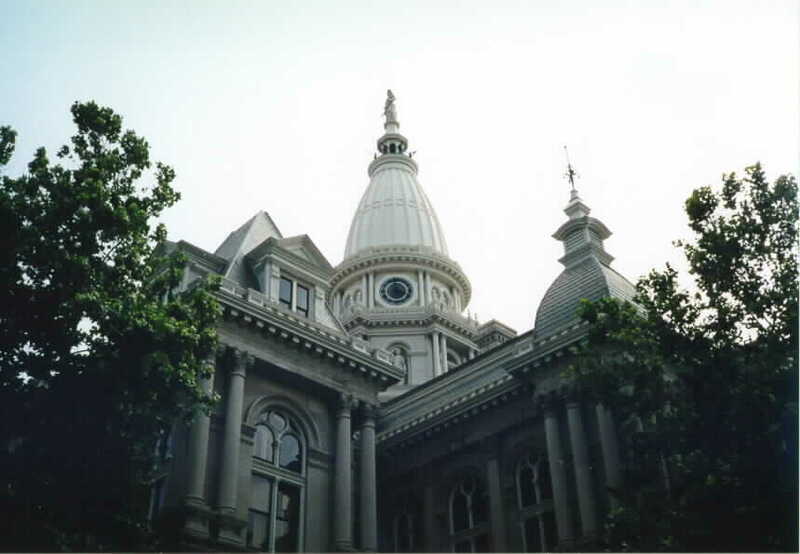 The cornerstone for the Tippecanoe County Courthouse was laid on October 28, 1882, and was celebrated with an elaborate procession. 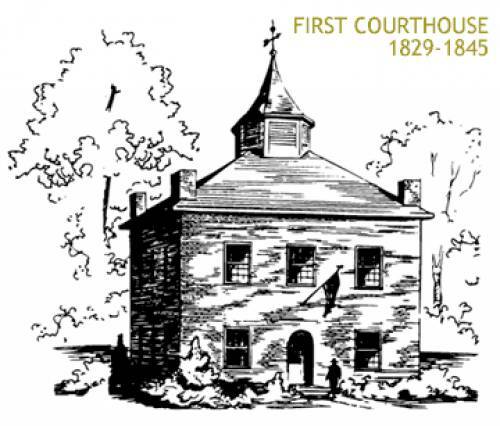 Two court houses had previously occupied the public square. The first built in 1829, was a two-story brick building that outgrew it usefulness by 1845 when a colonial style building replaced it on the same site. 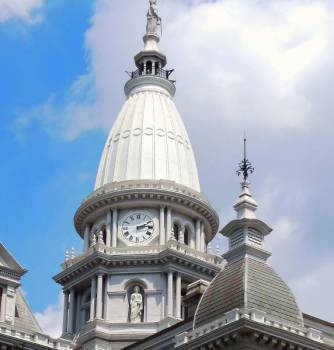 By 1880, Tippecanoe County residents pressured county officials to consider a structure "in keeping with the character and the wealth and the tone of one of the greatest Agricultural counties in all the broad West," according to a Lafayette newspaper. The square structure is ringed with 100 columns and is topped by a 14-foot statue of Liberty intended to symbolize the court's motto, "May Truth and Justice ever Prevail." 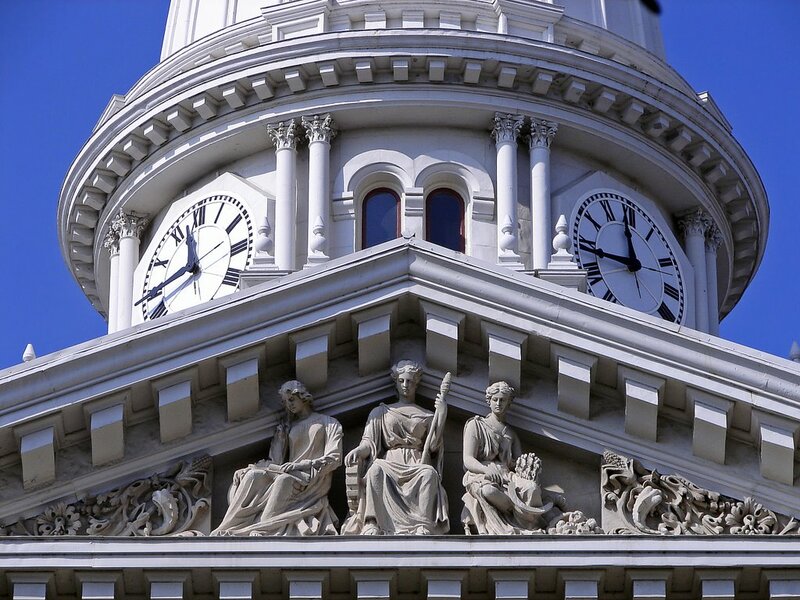 The dome is supported by a 92-foot hexagonal clock tower. Below each face of the clock is an enclosure surrounding a 9-foot female figure representing each of the four seasons. Stone, the principal building material, is accented by ornately carved 500-pound walnut doors. Above each door on the second level are pediments representing American ideals and leaders. The north and south pediments contain likenesses of George Rogers Clark, George Washington, and Tecumseh, a symbol of Indian history and leadership. The east and west pediments contain three feminine figures representing law, education and agriculture. Inside, there is a 150-foot square cross-shaped corridor system highlighted by a first floor mural by Robert Grafton depicting the Battle of Tippecanoe. Lafayette, named for America's friend from France. Founded by William Digby in May 1825. Head of navigation on Wabash River. Important part of Wabash Canal 1843-1859. Well-known station in "Underground Railroad". Home of Purdue University established 1874. Center of fertile agriculture area. Tippecanoe County, long a favorite abode of the Red Man. Scene of French and British rivalry, of Old Fort Ouiatenon and of the Battle of Tippecanoe. Staunch supporter of the Union 1861-1865. Responsive to the call of oppressed Cuba 1898. Lavish of wealth and manhood in the War 1917-1918. Seat of the State Soldier's Home. 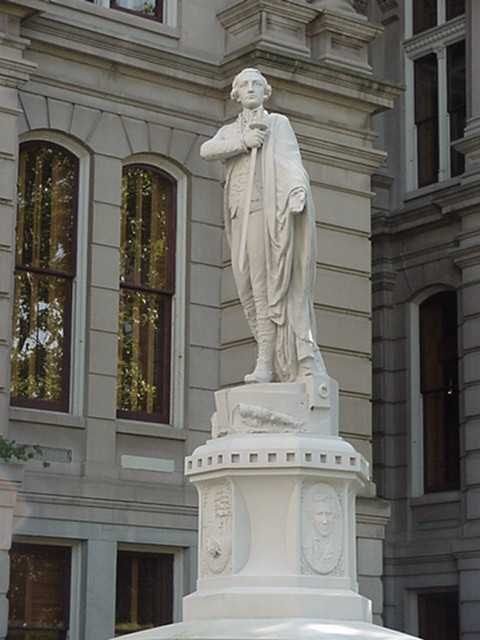 Rich in history and material resources, illustrious in gifted son and daughters, and sustained by devoted citizens, the City of Lafayette and Tippecanoe County, with reverence for the past and with confidence in the future, close their first century. Dedicated by Lafayette - Tippecanoe County Joint Centennial Council, September 28, 1925. 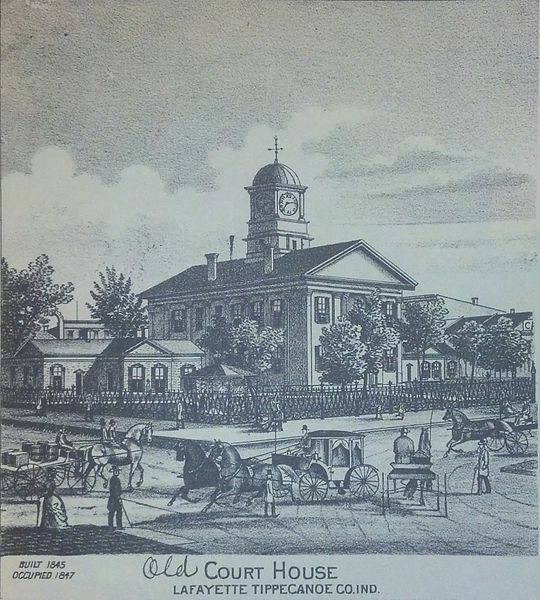 The Tippecanoe County Courthouse built in 1845 and occupied until 1881.